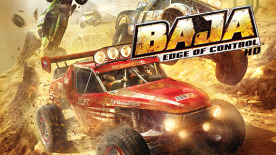 Baja: Edge of Control HD is the carefully remastered version of the original off-road racer from 2008 for Xbox 360 and PlayStation 3. This truly unique game contains more than 1,000 miles of the toughest terrain Mother Nature has to offer, including the steepest mountains, thickest mud and deepest canyons known to man. Only the HD version features much crisper and more detailed visuals running at super smooth framerates in up to 4K screen resolution. With more than 160 sponsored vehicles in eight classes , including Trophy Trucks, 4x4s and buggies, Baja: Edge of Control HD features a full array of upgradeable options with hundreds of authentic parts that affect each vehicle's performance. The game's revolutionary vehicle physics deliver unprecedented life-like handling, and a support management system that allows gamers to monitor and repair realistic vehicle damage as fenders fly, tires are blown, suspension is stressed and engines overheat. © 2017 THQ Nordic AB, Sweden. Developed by Blitworks. Originally Developed by 2XL Games. BAJA, THQ and their respective logos are trademarks and/or registered trademarks of THQ Nordic AB. All rights reserved. All other trademarks, logos and copyrights are property of their respective owners.